First Night Road ARC giveaway--you heard it here first! Check out these early reader reviews on NIGHT ROAD!!! Well, the official countdown has begun. Night Road comes out on March 22--those of you who have been following this blog for a while know that this is earlier than previously announced. That's right, the publisher has moved up publication to MARCH 22. That's less than six weeks away. That means spring is just around the corner. I can't believe how fast time is moving. Are you having the same sense? I mean, wasn't it just 2010? Who can join me???? I hope some of you can find time in your busy schedules to come and meet me on the road. It should be a lot of fun! And now, without further ado, here's the first official--and as yet top secret--NIGHT ROAD advance reading copy giveaway. I am going to give away a copy to one of you, my regular blog readers/posters. It's my way of saying thank you all of you who have been so supportive from the beginning. All you have to do is comment to this blog. On March 15th--one month from today, I'll pick one lucky winner to receive a signed copy of a collector's edition ARC of Night Road. If you want to double your chances of winning, check out my facebook page. http://www.facebook.com/AuthorKristinHannah I'll be giving away an ARC on there, too! And now that my first draft of the new book is done, what should I do? Run? Sleep? Go to the movies? No...READ!!! I can't WAIT to curl up with a good book. I'm busy collecting books (real books and ebooks) for my upcoming trip to Hawaii. What should I read next??? I'm looking for suggestions. By the way, THANK YOU TONS AND TONS to all of you who bought Winter Garden in the past few weeks. To my awe and amazement, the trade paperback version hit NUMBER ONE on the bookscan bestseller list for several weeks in a row. On top of that, WG hit the NY times, Wall Street Journal, Publishers Weekly, Bookscan, Barnes and Noble, and USA Today bestseller lists. I am so so grateful. Thanks! You guys rock! Yes -- a new blog post! Miss chatting with everyone. Hope everyone is well! Will be present for the dinner and the presentation at Thurber House in Columbus. Kristin, I checked and dress for the dinner is business casual -- people come from work. Attendance for the dinner is around 25-30, so anyone wanting to attend the dinner should call the Thurber House. The program will be much larger. Kristin has the info listed. Can't wait!!! Congratulations on #1 for Winter Garden -- I sure hope a producer reads it and sees what a compelling movie it would make. Am so happy to hear that you have your 2012 drafts written and that you really like the story. We won't have a clue until you show us the book jacket. Can't wait until Night Road comes out! The reviews have been great! Can't make it to the tour. I considered it, but the closest location is still over 200 miles away (I checked). I can't wait for Night Road! I need to stop reading them so quickly because I feel like I've waited forever for it. The Facebooks comments get very overwhelming so I don't often comment or read them all, but I'm glad you have so many followers. Are we going to have an Oscar blog to hear your thoughts on the winners? I am going to try to squeeze in one more movie before the awards next weekend. Congratulations on the best seller lists... Well deserved!!! I'm anxiously waiting for Night Road. Super excited that its moved up!!! I've finished the first two of Stiegg Larson's Millenium trilogy and I'm reading Cassandra Clare's The Clockwork Angel now... Can't wait to see others recommendations! Very excited for Night Road to come out (and excited for the chance to win!). I just finished Winter Garden and really liked it! Dallas? Really? YAYAYAYAYAYAY !!!!!!!!! Bring Kim with you! I can not wait to see you again (hopefully both of you)! Am counting days to Night Road! Hi Kristin! I'm so looking forward to reading Night Road and meeting you when you come to Columbus in April! It is my dream to become a successful, published writer someday. Your books are an inspiration. Thank you! Would love to win a copy of the book! Congrats on your successes! I am so excited for Night Road! I just gave one of my best friends a copy of Firefly Lane this weekend. She wants to road trip with me to see you on tour next month but she hadn't read any of your books. She reads WAY faster than me so she'll probably have more of your books than I do by the time Night Road comes out. I'm still debating between Dallas and Naperville but we'll definitely be at one of them! I would love to win this! I've been a fan since True Colors, and will be reading Night Road as soon as I can get my hands on it. I also plan to read the books before True Colors (except Things we do for love, which I've already read.) Anyway, long story short, love your books and hope to win! Do you stay in town long enough to hang out after the meeting at the bookstore? I SO want to spend time with you.. I have followed you for such a long time, and my begging has finally paid off.. You are coming to RALEIGH!! Woo HOO!!!!!! I am sure that you will be very popular that day.. I know that I will be one of many waiting in line.. I would so love a copy of Night Road! I love reading your books and re-read and recommend them to everyone. Thank you for sharing your stories with us. I'd love to come to one of the meetings, but I doubt that will happen...just know you have one loyal fan here in WV! I'm very excited to read Night Road. Although I don't "judge" a book by it's cover, I do love the colors and presentation of Night Road. Have you read Unbroken by Laura Hillenbrand (author of Seabiscuit)? Great writing, so interesting and what a refresher course in WWII history. It's the kind of book that when I'm not reading it, I'm thinking about it. Same holds true for Elizabeth Street by Laurie Fabiano. That book, although true, reads more like Roots. It's a story crafted from the author's family history. Have been counting the days till Night Road! Just know it is going to be another great book! Just finished Winter Garden and it was wonderful. Sure hope there is a movie someday. It was a roller coaster ride of emotions for me. Great job! I'm really looking forward to Night Road. The blurb has intrigued me from the beginning. I catch you periodically on FB but I don't even attempt to read through all the comments. LOL! It's easier to follow things here. Like you, I also enjoy writing/working when the husband isn't home. The husband went away for a weekend and I was inspired to pick up a WIP I started about 4 years ago that was giving me fits. Things started flowing, it was amazing! I have already read your new book NIGHT ROAD for BookReporter.com. I loved it! I will be reading it again. I have read all your books to date that are still in print. I have a "must read" list of authors and you top that list. Have a great day! I would really love to win this book. It would be right around my birthday. I am excited about the book tour! I am going to try my hardest to get to one of the Seattle area locations. I just finished Winter Garden and can't wait for Night Road. I'm so excited for your new book...Every book I've read by you has really touched me. Firefly Lane reminds me of my best friend, and I recommended the book to her and quite a few others...everyone loved it. Thank you for writing from the heart. Am so looking forward to Night Road. Too bad you aren't coming to the Tacoma area!!! I live in an Over 55 Park with new homes and we love reading and talking about all your books! I would love to win this book; it would be a great early 70th birthday gift for my April 27th birthday. Congratualations on your newest Book; may it be No. 1 on the NY Times list! I am eagerly awaiting this book. I would love to win it:) You are one of my favorite authors. Oh how I wish you had a tour date here in Florida! I can't wait for this book to come out though I have so many of your books to catch up on. I am so glad I saw Winter Garden at the store and grabbed it - I might have missed out on a wonderful author and such beautiful stories if I hadn't! And I can't wait for Night Road to come out, that tiny snippet in the back of Winter Garden was a cruel form of torture, waiting for the rest! Congrats on all of your success, Kristin! I'm really looking forward to Night Road. If you ever get a hankerin for the Lowcountry, come on down to Charleston - we'd love to meet ya! Was so happy to finally read a new post - I actually stopped checking this past week as I really thought we had lost you to Facebook. I don't do Facebook so have been depressed. 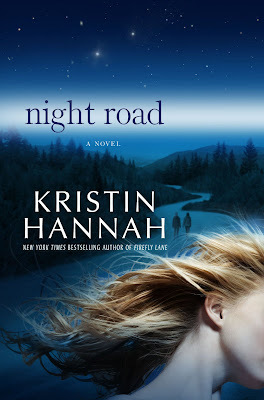 Would love to win Night Road - can't wait to read it. I don't know if you already read Water for Elephants but I just got around to reading it and I just loved it. It is coming out as a movie in the next few months and can't wait to see it. I miss reading what everyone is reading so hope that you will soon have more time to blog regularly. I read Firefly Lane a few years ago, and I just finished True Colors and Winter Garden. They were all great, but Winter Garden was just beautiful. I bought On Mystic Lake for a friend's birthday, with the stipulation that she let me borrow it when she's finished. :) I have also picked up copies of Summer Island and Between Sisters so that I can catch up on all of your books--I love rediscovering favorite authors and then having a store of novels to catch up on! I would love to win Night Road! Keep up the wonderful work! Just finished Winter Garden (literally 20 minutes ago). You have yourself a new fan! I will be getting another of your books tomorrow. I just finished reading "Winter Garden" and I literally fell in love. It was such a wonderful and moving book. "Firefly" is one of my all-time favorite books, and this one is right up there with it. Can't wait to read more of your work! Bravo! I recently discovered your books (through my coveted Nook review suggestions) and have thoroughly enjoyed each one I've read. Thanks for providing top-shelf entertainment! Looking forward to Night Road...sounds fantasti-mazing! Thanks for the beach treasures! Your South Florida fans look forward to a book signing locally some day! Redbank holds not too fond memories for my mom, but perhaps we can make a new memory. I mean, here it is: we both love tea, wine, cheese, Kristin Hannah. I think I'll buy her a ticket for an early birthday gift. I am so excited, and hopefully, unlike in my dreams, I'll be able to talk to you with some kind of elegance. A sad thing of late has been to hear of Belva Plain's passing. I've been re-reading all her lovely books, currently Secrecy. Another book I'd like to read is The Edge of the Sky. Interseting. There are not any tours near me but I would love for you to come to Sunny Florida sometime, hint hint! I am anxiously waiting the new release. I mentioned to you on Facebook that it is being released on the anniversary of my mom's death, the 9th anniversary. When you responded to me I got the impression that you knew my pain. I didn't know just how until I came here to your site. She will be looking down on my on that day smiling knowing that I am living my life the best way I know how, with my nose in a book. I already pre-ordered but would love an ARC so I can gift someone with my pre-order. Just started reading Magic Hour, this is the first book I have read by you and I really like the book so far. Can't wait to read other books by you. I can't wait for your latest release. The cover is beautiful. I completely adore all of your books! Just fantastic! I hope that the next tour you have you make it down to Florida because I would come to see you on a heatbeat! Everytime I read a book of yours I pass it on to my mom afterward and we are never let down! If you don't know what to read on tour I would suggest any Nicholas sparks books......your a fantastic writer and can't wait to read night road! Your a great writer and hope I can write as beautifuly as you someday. Congrats on your new book! You must be SO excited (& tired!) I can't wait to read it! Please include me in this giveaway. 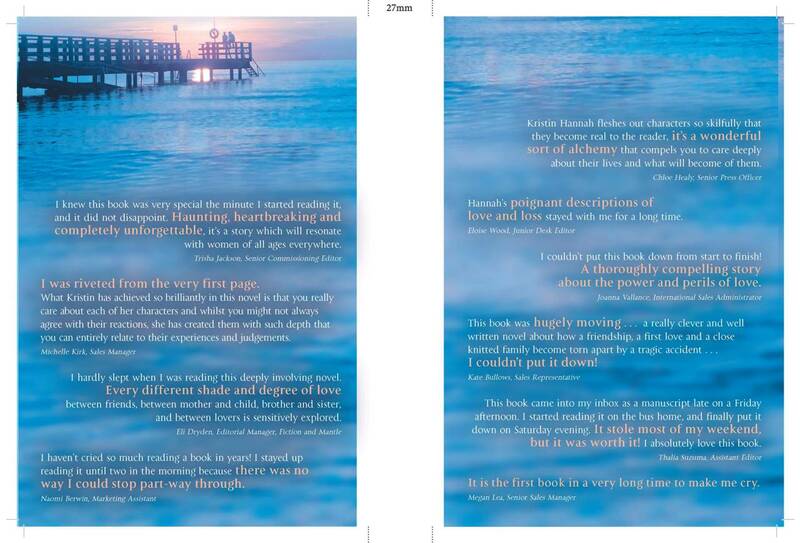 I'm excited for a new Kristin Hannah book! I'd love a copy of the new one (obviously) but I'm kinda bummed I can't make a tour date. The nearest one is over 4 hours away! Congrats for the release of this book in hardbook!! You have to be thrilled! I would love to win a copy. Thanks for the chance. Ahhh, so much to say and so little space! Congratulations on all your good news! (Nearing completion on latest work, WG on all bestseller lists, Night Road with early release.) I can relate to being able to work most productively when hubby is away. When mine is home I just want to celebrate our love doing fun stuff--so hard to make myself do anything productive. I always enjoy reading your fan letters here--I love recognizing the old ones and learning their news, and I vicarioulsy soak up their praise for your work--my fave this time probably has to be LindaHensens exuberant response to your forthcoming visit. I see no mention of Cali, so will have to miss you. Do you think you'll ever join the authors at the L.A. Times Festival of Books one year? I just finished spending time with Ruby, Nora, Caroline, Eric, Dino, Rand, and Jere and I gotta say, I sprung a leak every time I picked it up ("Summer Island" for those of you who might be reading this and are in the enviable position of having this read yet ahead of you). I just love it when a character finds him or her self and the courage to reach out. Aside from my non-fiction delves into horses and weather, I've also recently enjoyed Karen Harper's "The Twylight Tower" another "Elizabeth I Mystery" where Queen Elizabeth and her privy counsel solve a murder or two. Sorry once again for the bulk of text here. Have a lovely tour! After all, she breathed life into Alice, and then Tully and Kate, and then the whole family of Gray's, and she really made me cry buckets in Winter Garden.. This is going to be WAY cool! SO excited for your new book to come out! Congrats on all of your wonderful success! Cannot wait for Night Road! We have a group at work that passes around all of your books and we would love to win a copy of this one!! Looking forward to it! Im late...but i dont care! i just wanted to let you know that ive read all your books..they all have made me tear up! But my absolute fav was Winter Garden! I actually sobbed while i was reading it, and i could not put it down! all of your books have touched me in some way. I cannot wait to read your new one. You are my favorite author! Can't wait for Night Road! Firefly Lane is one of my favorite books of all time. I just finished reading If Only It Were True by Marc Levy and getting ready to start my first Heather Wardell book Seven Exes are Eight Too Many. Hopefully I will get to see you in Atlanta! I just finished Night Road and have to say it is the best by far. I have been blown away by all your books but this one is close to home. My daughter is going to be a senior and we deal with the talks all the time. My son has had some problems with this in the past. It takes you into what a parent can go through with so much detail I felt like I was her. This book is one I am recommending my daughter and friends and their kids to read. If it can make one child or adult think of the repercussions of their selfish actions then it will all be worth it. Thank you for such a great book. Night Road is an excellent read. Hope to read some more of your books.You are a great writer. Keep up the good work. We read Night Road for January. The discussion that followed at the meeting of Happy Bookers in San Antonio was one of the best. The book seemed to touch a chord in every member. There was so much sharing we almost forgot our lunch. Book Group just finished discussing Night Road. Lots of issues covered in book, so we had plenty to talk about. Some in group shared personal experiences of loss. Plot was a little too predictable for our tastes & we didn't think the character of Miles was sufficiently developed.